Settle down for this long read that comes to our blog from Birbhum, West Bengal. Suchana set out in 2005 to try to solve the problem of low learning levels among many adivasi primary school–going children in Birbhum, West Bengal. For part of the solution, we quickly settled on the fact that when Santal and Kora children start school they do not understand much of what they are expected to learn to read, because all teaching, and all learning materials are in Bengali. But trying to introduce first language / mother tongue methods – or even multilingual methods – in our teaching programme was made hugely challenging by the fact that there were no written materials for children in the languages the children spoke. For Kora, there were no written materials full stop. So we began to make materials. For Santali, this meant getting some guidance from organisations who had already been using Bengali script to write Santali, and then inspiring Santali teachers working in Suchana to tap into their creativity and write. For Kora, this meant generating a discussion among community leaders on how words should be written using the Bengali script; it meant young Kora teachers doing research among elders to re-learn disappearing Kora vocabularies; and it meant getting groups of young people together to write songs, rhymes, stories and a simple tri-lingual word book. But this creative process took time, and coupled with lengthy printing processes with hideous proofing challenges and equally challenging costs, this meant we could collectively only produce three or four small books a year. By 2014, we had produced 15 books. And meanwhile, the children in the education programmes were growing up. Their young years, in which access to first language materials could be such a critical intervention, were running out. Then in 2015, in a moment of serendipity, Suchana discovered Storyweaver. 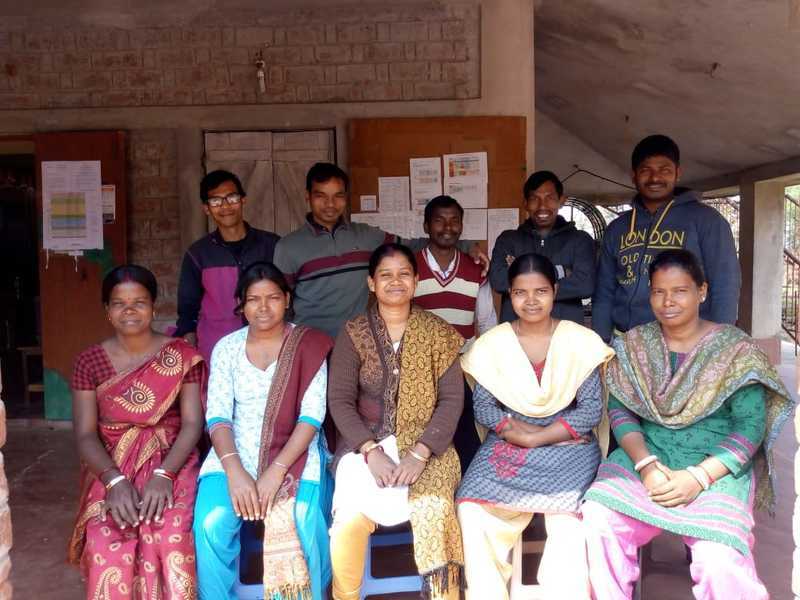 With a creative commons platform, a torrent of lovely stories graded into reading levels, and beautiful layouts to use, creating a varied, usable, children’s literature in Santali and Kora, suddenly changed from a daunting task to one within our grasp. The same young team of fifteen Santali and Kora teachers who had been involved in making books from scratch set to work. Most had acquired some technology skills through Suchana’s other programmes in the intervening years. They shared these skills with those who had not; and themselves learned to use the Suchana platform through a mixture of online tutorials, personalized help from the Storyweaver team, and a fair bit of trial and error. In their first translation marathon, they translated around 50 stories. Teachers chose freely which stories to translate from a pool of Bengali stories available on the platform, which they could translate from easily. With few options for getting their work formally reviewed and checked, they inserted quality control by creating a peer-review system in which they carefully checked each other’s work before stories were published online. We had gone from 15 to 65 in about 3 months. Concerned about how we would ensure that digital stories would reach the hands of children who had very little access to technology, Suchana arranged to print 20 of these stories. Both print and digital stories were then woven into Suchana’s mobile library programme which reaches about 1500 children. Librarians took laptops to remote mobile library villages and showed Santali and Kora digital stories to library members in read-aloud sessions. Children were then free to take home printed stories available in the library stock, where they could read them again, and read with their families. For many children with emerging literacy, being offered a chance to read stories in their own languages was like a light switching on. Suddenly, text which usually seemed dense and difficult made sense and fitted together. Now, when they were not sure how a particular letter in a word worked, they could make deductions based on their understanding of the likely word being represented to figure out what the letter was doing. Suddenly, it was possible to have meaning fall into the place of decoded text, and the story rise out. But even 50 stories – about 25 in each language – can get read quite quickly among a multi-age group with library sessions every week. So in 2018, Suchana joined Storyweaver’s Freedom to Read Campaign and the push to 100 stories in each language. Beyond reaching Santali and Kora stories to children through the mobile library membership, Suchana had just begun to work more consistently with local primary schools and ICDS anganwadis on using mother-tongue methods in early years’ classrooms. Most teachers and anganwadi staff teaching adivasi children do not have the luxury of knowing the languages of the children they are charged to teach, and many are acutely aware of the difficulties this presents. So Suchana’s second translation marathon focused partly on producing bilingual books in Santali-Bengali and Kora-Bengali – with a view to enabling willing teachers to help their Santali and Kora students access stories in their own languages too. Watch this space for more information in a few months on how this initiative goes. This week we crossed 212 stories: just over 100 in Santali; just over 90 in Kora; and 15 stories Suchana had produced from scratch. This feels like a very different place we have arrived at. Several hundred children are now reading a real variety of books in their own languages – from very simple, to more complex ‘Level 4’ books as they progress in their literacy; and books which can help themselves and their teachers transition from their own languages into Bengali, the language of their schools. They read about animals, people, families, friends, trees, maths concepts, science ideas, joy, sadness, and everything in between, in their own languages. The amazing worlds that children’s literature can open up have finally become theirs. Congratulations for this huge achievement to the Suchana translation team: Bhabini Baski, Churki Hansda, Komola Murmu, Sova Tudu, Lakshman Hembram, Subhadra Murmu, Narayan Hembram, Shanto Kora, Kumkum Kora, Debika Kora, Kalicharan Kora, Rajesh Kora, Pathik Kora, Nobin Kora, Anjana Kora and Krishna Kora. We have not finished, but Storyweaver has started something, and we are on the way.